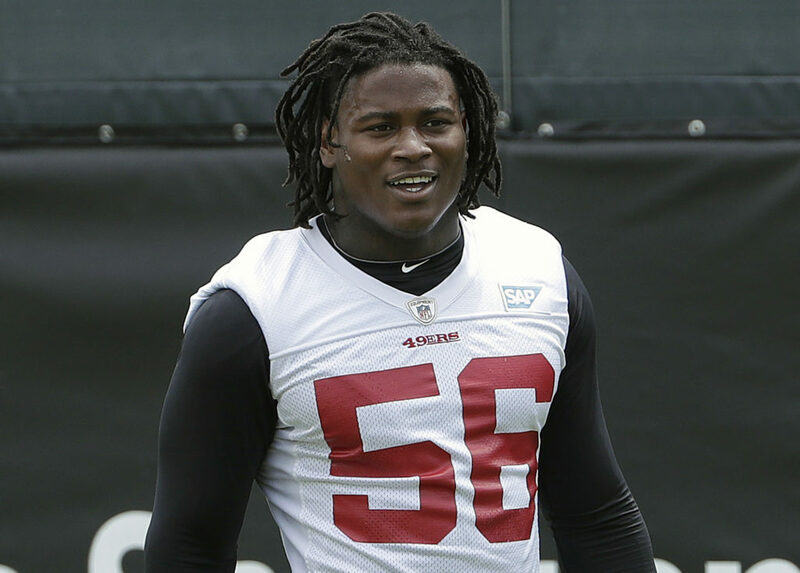 Police arrested 49ers linebacker Reuben Foster and charged him with domestic violence Saturday Night. They arrested him at the hotel where the 49ers are staying, the Grand Hyatt in Tampa, Florida. Foster faced a felony domestic violence charge this past April and went to court, but a judge dismissed the case. “Tampa Police officers responded to the Grand Hyatt hotel to investigate a domestic violence call shortly after 9 p.m. on November 24. Reuben Foster and the female victim were involved in a verbal altercation. The victim stated that during the altercation Foster slapped the phone out of her hand, pushed her in the chest area and slapped her with an open hand on the right side of her face. Officers observed a one inch scratch on the victim’s left collar bone. “During the investigation officers learned that Foster and the victim lived together in the past and they were involved in an on-again-off-again relationship over the past three years. To read more about Foster’s latest incident, click here. Jennifer Lee Chan is speculating it is the same woman as last time. WTF is he still doing in contact with her? Just very sad. Such a waste, and another wasted pick for the 9ers. I suppose in the future just stay clear of players with past issues. You called it Grant, right after the draft. He had issues coming out of the draft, and I mean seriously, he had his draft party sponsored by a weed or was it vape company for crying out loud. Too bad. We HAVE to cut bait now. Niners should avoid red flagged players. Not worth the headache, and he could disappear like a puff of smoke. However, if she is the past GF, and is stalking him, and shaking him down for money, I hope Foster has witnesses. Even if she were, he is either still in contact with her or is putting himself around her when he should be staying the hell away. I don’t see a justifiable explanation here that would convince me that he should stay on this team. He’s either malicious or willfully stupid. He was at the team hotel in Tampa. He was not actively seeking her out. He should have gotten a restraining order against her. Sounds like stalking to me. If he had stayed in his room or with the rest of the team there would be enough witnesses around that he would avoid being arrested. IF it is the same girl, and we don’t know if it is, then this is another case of him handling it poorly. What is it with some fans defaulting to taking the players side over this? Do they think them being players for the 49ers means they automatically can’t be guilty of this kind of stuff, or does it just not matter to them? I’m not advocating for a lynching here. I’m happy to wait for the facts, but as of right now, I can’t see a story here that tells me he showed good judgement in this case and it was unavoidable. And yeah, that is important because after the off-season if he was in fact innocent I would expect showing good judgement was preached to him. Instead, he’s gotten arrested the night before game day potentially affecting the whole team. That’s terrible. Hope everyone learns from this, and moves on. It does sound like she was stalking him. She obviously has some serious mental issues and unless she just blindsided him with a surprise visit he should know better than to even be around her. Well lets see if this is another one of those crazy episodes . Matters very little at this point…just wondering if any other 9ers were with Foster as the incident unfolded. Judging by his release this morning, it seems that there either wasn’t any corroboration on his behalf, or the organization has simply had enough. Curious–if any 9ers were present–if they tried to defuse the situation. No, now we know that Foster continued to have a relationship with her. He should have handed her a restraining order. Foster let her in, so it is his own dang fault. I’m out. He’s gotta go. Even if he’s innocent in this case, he should have learned not to put himself into these situations in the first place. What a swing in energy. An electric day (and night) of college football–warts and all–and then to learn of this breaking development. Well, glad Lynch and Shanahan aren’t repeating the same mistakes of their predecessors. How’s that breath of fresh air? Just read on PFT that 49ers are releasing Rueben Foster. What a waste of talent. John Lynch is now officially under the microscope for a bust of a 1st round pick. Both 2017 first rounders have turned into horrible picks. Great way to rebuild a team. At least we didn’t trade up for any duds too….oh wait. Thomas and Foster were ranked 2 and 3 on the 49ers draft board. Says a lot about where they’re currently at. Thomas was rated 2 or 3 on almost every teams board. Saints dodged a bullet. They had him on the phone before the Niners ninja’d him. Foster hung up on them. You have to wonder if things like this happen much more often when the players are in college, but it is hushed up by the locals. Did Foster wait until he got his degree in stupid crimes and then put it to work after he left Alabama? Add this to the fact that the NCAA is not fully training players to be NFL ready anymore (according to KS and others) and I think they need to rethink their free Farm System. Too bad we cant’ just send him back down to the minors for some additional rehab. It almost certainly happens in College and gets swept under the rug. This guy will end up in a prison someday. To many coincidences don’t add up at all. Grant did, and many dissed him before she dropped the charges. Sometimes you win, sometimes you lose. Reuben Foster’s got the blues. What a shame. You can argue whether or not the severity of the rebuild was necessary, but it can’t be easy rebuilding a team like this. Not enough draft picks and free agents to do it efficiently (and cost effectively) in very short order. You’ve got to make the most of every choice. Chalking this up to Lynch “learning” some painful lessons on-the-job, and I’m hoping that he has too much pride to repeat this mistake. Why are some of the people on this thread having a difficult time accepting that Ruben Foster is A WOMAN BEATER? They are out there. Lots of them. Stop making excuses for this psycho!